Tucked away in South West France, Gascony with its lush, rolling landscape, is the home of Armagnac, the oldest spirit in France that celebrated 700 years of history in 2010. Amanda Garnham reports. The Armagnac region spreads over three rural departments, the Gers, the Landes and a small part of the Lot-et-Garonne. Steeped in history, this area is rich in its bounty of gastronomy and good living with small family estates producing traditional produce including duck, from foie gras to confit, prunes, walnuts, figs, wine and Armagnac. The Armagnac appellation is separated into three ‘terroirs’ with different soil types: Bas-Armagnac with its sandy soils, Tenarèze on clay and limestone and Haut Armagnac that is predominantly limestone. 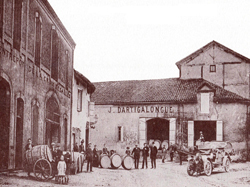 Founded in 1838 in the town of Nogaro, Bas-Armagnac Dartigalongue is an historic house traditionally producing Armagnacs for over a century. The Dartigalongue family create a selection of typical blends like VSOP and XO as well as innovative combinations such as the Cuvée Louis Philippe, a blend of the 1974 and 1976, created to celebrate Dartigalongue’s 170th anniversary. Another house with an extensive range of vintages is Château de Laubade, also in Bas-Armagnac, that prides itself on having the largest single Armagnac estate of 110 hectares. With a backdrop of the stunning Pyrenées, the vineyard comprises the four principal grape varieties; Ugni Blanc, Folle Blanche, Baco and Colombard. The Lesgourgues family has a policy of sustainable agriculture, hence 30 hectares of oaks have been planted to compensate for the felling used for barrels. Further still, 600 sheep graze throughout the vineyard in the winter, thereby substantially reducing the need for chemical fertilisers. The château’s cellars hold 2,800 barrels of Armagnac dating from 1886 to the present day and it produces VSOP, XO and other premium blends like the ‘Extra’, blended from a selection of more than 50 very old Armagnacs. Diversity is the best word to describe Armagnac as each house offers a different style. Baron de Sigognac is another producer in Bas-Armagnac on the famous tawny sands renowned for the finesse and aromatic quality they bring to Armagnac. Father and son work together on the estate where wines from their Ugni Blanc and Baco grapes are naturally fermented and distilled in a traditional single distillation 1921 alambic. The distillation takes place during November and each year they reserve five to 10 barrels of the production for future vintages, whilst the other barrels are used for the blends. By keeping back these barrels, Sigognac has been able to build an exclusive range of vintages. Baron de Sigognac Armagnacs are exported worldwide. Travelling east into the Tenarèze where the soils change to a mix of clay and limestone, we discover Château de Pellehaut. Martin and Mathieu Béraut run 530 hectares including 250 hectares of vines for their wines and Armagnacs, whilst the remaining land is used to raise cattle and cereals. Ugni Blanc and Folle Blanche (an historical Armagnac grape that gives finesse and complexity) are grown and following the distillation, the eau-de-vie ages in 400-litre French oak casks, some of which are sourced from oaks on the property. Special blends created by the Béraut family include the gold medal winner Réserve de Gaston, a marriage of both varieties, aged for at least 10 years.